There’s No Crying In Childhood! Oh, but there is. There is lots and lots of crying. There is crying over spilled milk. There is crying over a lost lovie. There is crying over the color of socks, and cups. And, some days it seems there is non-stop crying over the injustices your sibling inflicts on you. So. Much. Crying. From the first day we bring our new little babies home with us it is our job as parents to discern what our children’s cries mean. Are they crying to request comfort? Hunger? Sadness? Pain? Is it just gas? As our babies become big kids our job becomes soothing them through the tears and helping them understand the emotions pushing them to cry. With two very emotional humans in my charge, I have come to realize there are times when I simply have to let them cry it out. Last week, during gymnastics class I hear my daughter cry from across the expansive gym. I immediately jump up and start moving toward her when I notice the instructor is still instructing the other kids over my child’s cries. I realize she isn’t hurt. She is crying because of some other reason. I battle with myself about what to do next. Do I rush in and save her? Do I remove her from the class (and her consequence) or do I let her cry it out so that she gets the full lesson here? So, if she isn’t hurt why is she crying? My girl could not get a handle on her energy and got too rowdy for the class. She was not listening to instruction (which can be dangerous when climbing and jumping off of gym equipment). As a result she had to sit out a turn. It made her sad to miss a turn and she became upset with herself for not listening. Her process for dealing with being told “no” is curling up in a ball on the floor, covering her eyes and begin sobbing. I really want to go get her to make it stop (partly out of embarrassment because of my kids lack of maturity, and I also want to assure her she is OK). Instead, I linger on the sidelines where the instructor can visibly see me, but my child can not. And, I wait. A few minutes later, my kid is still crying. The instructor scoops her up and brings her to me and explains she isn’t listening and will not accept the consequence. Simply being told “no” threw my kid into an emotional tale spin. In that moment I wanted her to understand that her behavior lead to this consequence. She needs to know that when she isn’t behaving safely, or following rules there will be a consequence; and consequences don’t just come from mommy. One day she will be out in the big wide world and will need to know how to cope and process through bigger consequences. I would be lying if I didn’t share I was disappointed and angry. I took a deep breath. Got down on her level and said firmly, “you need to listen to your teacher or you are not coming back. Do you understand me?” She looked at me with her eyes full of tears, choked back her last sob and said, “Ok mama.” “Are you ready to get back in there and listen?” “Yes.” “OK, class is over in 10 minutes.” She ran back to her class eager to finish up the remaining few minutes with them. Processing emotions with our kids can be so hard! It is hard to set aside our demands and expectations for what we WANT them to do RIGHT NOW! I think my taking a moment to breathe and taking a moment to think really helped not only steady me emotionally, but steady her emotionally as well. So, she cried a little. So, her feelings were hurt because she was disappointed. That’s life. We need to let our kids live life and feel the full spectrum of emotions- not just the fun stuff, not just the magical joy. Those are important too. But, if we always swoop in to take away our kids hurts they won’t learn to cope with them. My kids are still little, so listening attentively just isn’t going to happen. I get that. But, what we are working on here at this age is building a foundation our kids can build upon- a foundation that will keep them secure when they grow up and live on their own. Sometimes it’s OK to let the kids cry. « Friday Favorites – Poofy Organics GIVEAWAY! 18 Comments on There’s No Crying In Childhood! My little ones are full of tantrums these days. I know it is only temporary! I have a 2 year old so I totally get this and relate to it 100%! I have had to let him cry it out a lot lately. As exhausting as it is, I know he is learning a valuable lesson and becoming familiar with the word “no” is a must for coping throughout life. Crying is just another form of communication. Tantrums will pass, hopefully — many adults still have them! We don’t get many tears over here unless it’s something major like and injury or stress. I just tell the kids it will be ok and let them cry it out. Listening is huge too, let them tell you why they feel the way they do. Sometimes they just need to be heard. Childhood is full of tears but those tears are full of memories that can help us remember the past. Major props for knowing your kids and recognizing and communicating the consequences of actions to even little kids. I see so many parents jump to the ‘not my angel’/who’s to blame for this script before truly reading a situation and, in the end, the kids don’t get the benefit of learning how to handle disappointment. It is definitely important to let them cry it out sometimes. It’s hard, so hard, to do sometimes, but it’s a necessary tool in the parenting bag to teach your kids responsibility and accountability. My son is drama Llama and cries about every single thing. We try to talk him through his emotions, but it’s just in his genes. I cry at the drop of a hat. That’s one thing I”m not looking forward to whenever I have kids! Some parents really get lucky with compliant, happy go lucky kids! I wasn’t one of them, but I see other parents who have them. 😉 Good luck! My daughter is beyond emotional… I wonder where she gets it from? Lol. But I agree, it’s important to let them know that they can cry if that is how upset they are. But listening to rules is a must. I love a good cry. It’s a nice release for me to be able to move on. 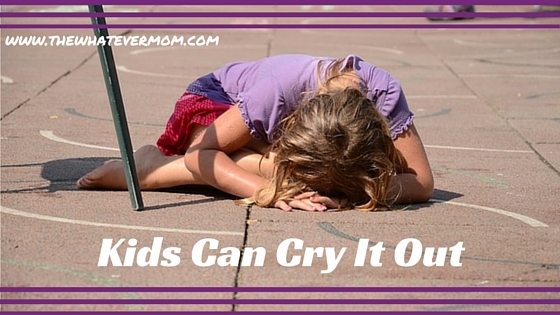 I agree, sometimes, we have to let our kids cry. My girls are very sensitive, too. You tell them something and they cry easily. I just try my best to explain things to them. I agree! Kids just need to be kids and that comes with motional growth/changes.